Sarvajit was living a happy life with his mother, wife and two children in Salyan in the mid-western region of Nepal. 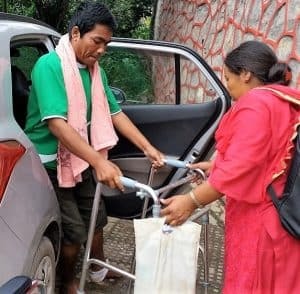 He and his wife were running a small grocery shop which was doing good business and he was able to cover the family’s monthly expenses and pay for his son’s schooling. Two years ago. Sarvajit had the opportunity to go to Malaysia to work as a labourer. His family were happy and the dream of finally being able to ‘earn some savings’ was about to become a reality. He went to Malaysia in 2017 and after working for several months, he was able to send some money back home. A few months later though, disaster struck. 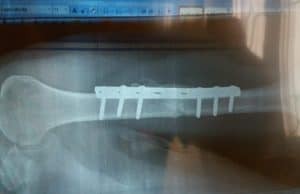 He had a work place accident and fell three stories from a building, fracturing his left arm, leg and pelvis. He was rushed to the hospital and operated on. After a month, the company he was working for advised him that they had spent all the money allocated for his treatment and cannot do anything more for him. They sent him back to Nepal. He was admitted to Kritipur Hospital in Kathmandu where he remained for a month, before being transferred to Kathmandu Model Hospital. He began to experience increasing numbness in his left leg and another month down the track he was transferred to Manmohan Cardiac Hospital which has an orthopaedic ward. 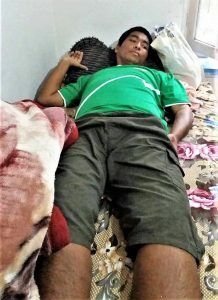 After reviewing his reports, the doctors operated on both his pelvis, leg and left arm again and was transferred to the neurology department in severe pain for further treatment before being discharged from hospital. He was asked to return every week for follow up which is very difficult when you live many miles away. By this time, three months in different hospitals in Kathmandu had cost Sarvajit’s family about 12 lakh Nepalese rupees (US$12,000). He took loans from relatives, friends and villagers to cover his treatment as his savings were nowhere near enough. He decided that he would simply return home as they could not pay for any further treatment. Sarvajit was on high doses of analgesia (pain killers) but after a month he could not handle the pain. Someone had told him about a special Neuro hospital, so he returned to Kathmandu hoping they could help. He borrowed more funds which were only sufficient for twelve days. He had some physio and when the money ran out, he returned home. He lasted another three months and then attended a follow-up appointment at the Manmohan Cardio hospital. This time the family decided to stay/sleep in the lobby of the hospital until his treatment was finished. They overcame their pride and began to ask for money from people at the hospital because they knew, without money, there would be no help. Luckily for Sarvajit, he met a nurse called Chandrika who knows NHEDF very well. She coordinated with us and we happily admitted him. Now he is having good care at NHEDF. He has three meals a day, nursing care and most importantly, physiotherapy and everything is free. We need financial support to be able to continue his treatment. Can you help? Previous Previous post: Meet Prakash who really needs a bone marrow transplant at a cost of $25,000!